This condo is in one of the newer complexes built in the new Copper Mountain Center Village. It is located directly behind the Copper Commons at the base of the ski lifts (American Eagle & American Flyer). With all of the mountain flair possible, it is accentuated with log furniture and log accents throughout. This building is beautiful inside and out. Enter the tiled warm and inviting lobby in order to reach the fitness room, steam & sauna rooms, ski locker rooms, and large outdoor in ground hot tub. Being a second floor unit the views are enhanced. This 600 sq. 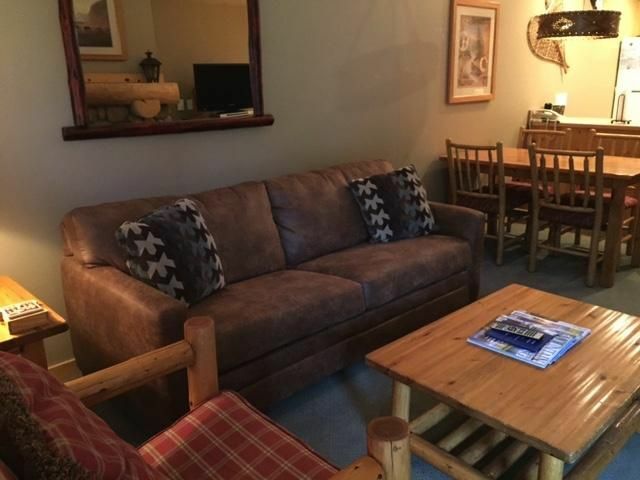 ft., 1 bedroom, 1 bath is exquisitely decorated in mountain colors, and a mountain theme. The kitchen and full bathroom are tiled. The open kitchen is bright and cheery. The bedroom is tastefully decorated and has a queen log bed with windows that overlook the deck and creek. A TV/DVD is also provided for your enjoyment. This unit sleeps a maximum of four. Park your car in the underground parking, because you will no longer need it. This condo is 562 square feet. We stay at Copper Mountain yearly. This was our first vrbo here. Overall we liked staying direct with an owner vs booking from the resort. The beds were not the best but suitable. The bath and tub etc. were really nice the room was clean and lockers and location of the room was good as well. Checking in and checking out was easy, and the owners were good communicators. Great place to stay for skiing and after skiing. The best location we can image, well equipped and decorated, very convenient underground parking. Very easy contact directly with Amy or Mike, so we were filling as in our home. We will strongly recommended this property for the future to our friends. We loved it !!!! !